Since the birth of my son, I’ve turned to my Mother from time to time for insight and advice. She raised my brother and I, and we turned out pretty great, so naturally I thought she’d be a wellspring of information on babies. 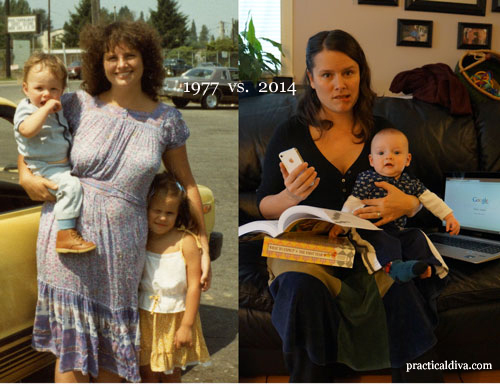 So this got me thinking about the vast difference in the typical Mommy stress in 1977 compared to 2014. I guess some things are the same. I just try to gently remind myself — whenever I am stressing out over (lack of) naps, forgetting the daily D drops, or my son being in the 5-10th weight percentile — that I truly am doing the best I can and if he’s fed, clean, happy, and the house isn’t on fire, then it’s a good day. And now that I’ve already read all the books, websites and blogs, I can just let it all go, trust my instincts and be a carefree millennium-hippie Mom. (I think I just made that term up) I can try, at least. Besides, apparently late night TV and second-hand pot smoke didn’t hurt me!